While we continue with the seemingly endless wait for our new bikes, I notice that as a driver, I’m becoming much more aware of cyclists and their visibility. Often, it leaves a lot to be desired. It’s been cycling season here in France – the time when seemingly every local man, young or old, hauls himself into lycra and a big pointy helmet and gets on his flighty road steed. But why are so many of them wearing black? Black strikes me as a dumb colour to wear on grey roads. Even those wearing colour only have it in patches that act something like camouflage – the last thing I would have thought a cyclist would want. Last Sunday, driving in pea-soup fog to the swimming pool, I passed a peleton. I only saw them at the last minute, as all had black shorts, and few had on a bright jersey. No lights either. Yesterday, it was a jogger, wearing navy and grey on a grey road. The only part of her that was visible at a distance was the red soles of her shoes. Not to mention the local oldies, who cycle between field and farmhouse wearing whatever bleu de travail (sometimes it’s green) they happen to have on, thus blending in perfectly with their surroundings. I can’t be alone in thinking that this is dumb. 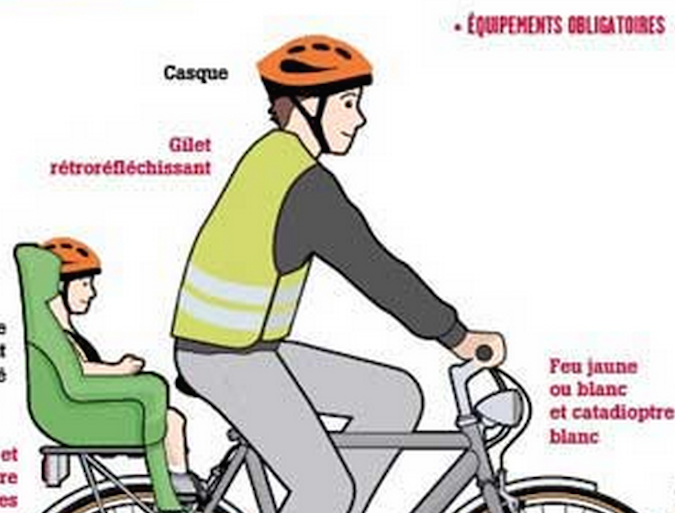 It’s also, as it happens, illegal in the case of cyclists, who are required by French law to wear a high-vis, reflective gilet, and to carry (if not use) both front and rear lights. I am constantly amazed by how little awareness some people have of the issue of visibility on the road. For instance, I have had people flag me down, in broad daylight, to tell me that I have the car’s headlamps on. Well yes, I drive with my headlamps on – in all weathers. The car is black, and when I drive through deep shade, even on a sunny day, it becomes completely invisible. Having the lights on doesn’t help me to SEE the road – it helps me to BE SEEN. To be honest, I think it should be law that you drive with your lights on at all times, as it is in Sweden. When you yourself are the vulnerable road user, visibility is surely even more important, and on the rare occasions that I’ve seen cyclists in their high-vis gear here, shining out half a mile away, I thank heavens that they’ve given me as a driver a chance to plan how to pass them well in advance. Now that we are about to become two-wheel road users, the DH and I have invested quite a lot in our cycling high-vis. Because much of the countryside is yellow in certain seasons, he has gone for orange (far more visible anyway than yellow), and I have gone for screaming Stabilo-Boss highlighter pink, which is meant to stand out best against green. We have also stocked up on banks of lights, and are buying reflective tape to stick on everything from panniers to the Doggyhut, not to mention the dogs, who for some years now have had high-vis vests, reflective strips and LED-light collars for winter. I do worry that far too many cyclists are concerned about looking ‘cool’ or trendy on their bikes rather than looking visible. But in a tussle with a car or a van, you know who’s going to come off worst, don’t you? Why not just be on the safe side? NB: more about our high-vis gear, including reviews, in later posts.